Safilo says developing nickel-free decorative galvanic finishes was a top priority to ensure the safety of both consumers and its workers. 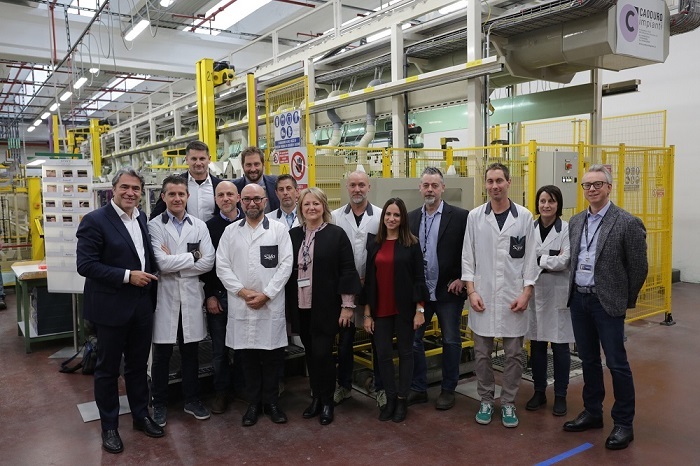 The company has introduced 100 per cent nickel-free production processes at its facility in Longarone in northeastern Italy. “Nickel is a silvery-white metal traditionally employed in the galvanic treatment of eyewear for its sleek, gloss finish or used as a base coat for other surface treatments. Although glasses come in direct contact with the skin only to a limited extent, they are among the accessories that may cause nickel allergies or allergic contact dermatitis, producing itchy skin rashes and eczema,” says Safilo. It is estimated that nickel allergies affect one per cent of men and 10 per cent of women worldwide. Moreover, nickel salts used in galvanic baths are classified as carcinogens by inhalation and are, thus, subject to stringent preventive and protection measures during handling to protect workers from risks related to exposure to carcinogens. Safilo developed nickel-free and non-cyanide galvanic processes only two years after the first nickel-free laboratory experiments. These have already been tested and are currently in use across all the production lines, from high-end to middle-segment eyewear products. Thanks to the new galvanic process technology – a first in the eyewear sector – metal frames currently manufactured at the Longarone facility boast the same features, in terms of sleekness, wear- and corrosion-resistance as before and are nickel-free. Through quality controls performed on a regular basis by the recently restored in-house lab, now equipped with the most cutting-edge technology, Safilo can apply more stringent and improved qualitative standards to coating processes than those imposed under applicable law. Safilo has also implemented a series of sustainability, environmental impact and safety initiatives at the Longarone facility, including precious metal recycling, industrial water reuse – thus also reducing water usage and wastewater production – CO2 emission reduction and the improvement of workers’ health and safety indexes. Safilo obtained the highest certifications in terms of quality, safety and corporate social responsibility – the most recent being the ISO 50001 energy management system certification which is currently underway. This was made possible thanks to various factors, such as energy efficiency, the use of sustainable, low-environmental impact materials and the reduction of carbon emissions, which are constantly monitored by external parties on all the production methods and technologies used. With approximately 1,000 workers, the Longarone facility is the largest of the four Safilo plants. The state-of-the-art, end-to-end facility primarily focuses on the production of metal eyewear, covering the entire production cycle and is at the forefront of technology.